Jim McGuinn, later known as Roger, was already a veteran of the New York and Los Angeles music scene when he co-founded the group that would become the Byrds with Gene Clark and David Crosby in 1964. 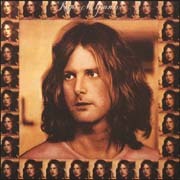 Roger McGuinn, prior to forming the Byrds, toured and performed folk musicwith the Limeliters, Chad Mitchell Trio and Bobby Darin as a guitarist and banjo player. 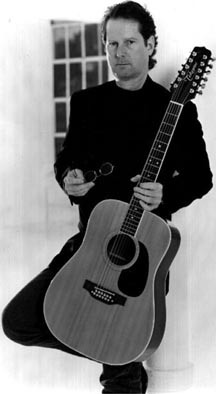 McGuinn, a Chicago native, studied at the Old Town School of Folk Music and was active on Chicago's folk scene, where he was strongly influenced as a teenager by Bob Gibson. Within a few weeks of finishing high school, McGuinn was working with the Limeliters in California, and he played guitar and banjo on their album "Tonight: In Person." McGuinn is also on the Chad Mitchell Trio's album "Mighty Day on Campus",1961. After touring for awhile with singer Bobby Darin, McGuinn moved to New York at Darin's request to work for his publishing company, TM Music, in the the fabled Brill Building as a songwriter. He and Frank Gari co wrote the song "Beach Ball,"and performed it with Darin, as the City Surfers, on a very rare single, July 1963. After hearing the Beatles for the first time at the Brill Building, Roger began playing folk songs to a rock beat in the coffee houses of Greenwich Village . His experiments in merging folk and rock didn't please the folk purist, so he moved to Los Angeles to work at the Troubadour. It was after an opening set for Hoyt Axton that Gene Clark approached Roger with appreciation for his new musical blend.They started writing songs together in the folk den of the Troubadour. It wasn't long before David Crosby joined them and added his unique concepts of harmony to the duo, thereby completing the underpinnings for one of the most influential bands of the '60s. Within a few months, McGuinn, Clark & Crosby were looking to expand their group. Conga player Michael Clarke was recruited because he looked like two of the Rolling Stones. Mandolin player Chris Hillman was asked to join the group and learn to play the bass guitar. During a Thanksgiving dinner the band settled on the name "Byrds," and success was just around the corner. Columbia Records signed the Byrds in January 1965 and they recorded their first number one hit, "Mr. Tambourine Man." In 1968 McGuinn and Hillman hired Gram Parsons and headed for Nashville where they recorded the now critically acclaimed "Sweetheart of the Rodeo." 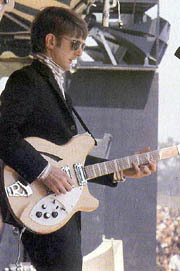 Roger McGuinn disbanded the Byrds in 1973 to pursue his dream of a solo career. He made five solo albums on Columbia Records. .
McGuinn rejoined Gene Clark and Chris Hillman in 1978 on Capitol Records for three albums. In 1981 Roger decided it was time to return to his folk roots and began touring solo acoustic. Arista records released "Back From Rio" in 1991, a rock album that included his friends, Tom Petty and The Heartbreakers, Elvis Costello, Chris Hillman, David Crosby, Michael Penn and John Jorgensen. After touring extensively to support the album he returned to his roots - folk music. In November 1995, McGuinn began recording and uploading to the Internet a series of traditional folk songs to his web site. The recordings are available for free download at the "Folk Den - http://folkden.com," part of McGuinn's home page - http://mcguinn.com. The autobiographical one man show, "Live from Mars," was released on Hollywood Records in November of 1996. 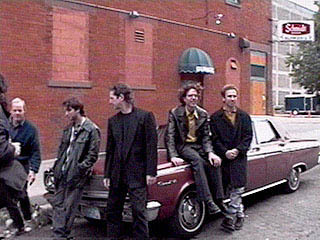 The album includes two studio tracks, "May The Road Rise To Meet You," and "Fireworks," recorded in Minneapolis with members of the Jayhawks. Roger's CD recorded on Appleseed Recordings, titled "Treasures From The Folk Den." A CD of favorite songs from the Folk Den with the added bonus of duets with Pete Seeger, Joan Baez, Judy Collins, Odetta, Jean Ritchie, Josh White Jr. and Frank and Mary Hamilton. It was nominated for a Grammy in 2002 in the category of "Best Traditional Folk Album." Article copyright 1996 by Richard E. Russel. Excerpt from "Mr. Tambourine Man" performed and copyright by Roger McGuinn; used by permission. 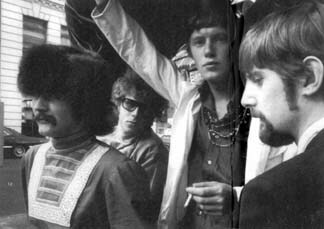 Byrds 1967 photo reprinted from "Younger than Yesterday" CD insert. Recent McGuinn photo, at top, courtesy of Roger McGuinn. 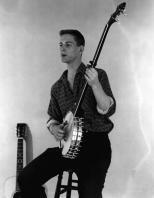 Photo of a young McGuinn by Jim Marshall. McGuinn Clark & Hillman and Crosby McGuinn & Hillman photos by Henry Diltz from the Under the Covers CD-ROM (used by permission). Roger McGuinn and Jayhawks photo courtesy of Roger McGuinn. Special thanks to Laura Theobald for the photo of Chris Hillman and Roger McGuinn from Live Oak, Florida, 3/28/98. Sources of other photos unknown. Material may not be reprinted without permission.